Formulated with two percent salicylic acid, this product acts like an exfoliant to help keep pores unclogged, help clear existing blemishes and prevent future breakouts. Glides on smoothly and absorbs quickly. Contains soothing botanical extracts including Canadian willowherb, sea heather, burdock root and avocado pears. Oil-free. Fragrance-free. Non-comedogenic. Suitable for sensitive skin. 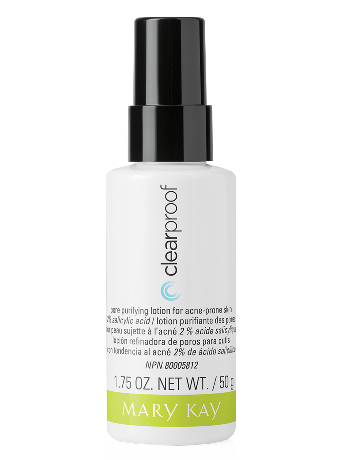 This lotion is part of Clear Proof®, a comprehensive skin care regimen dedicated to fighting acne. Several products in the system feature salicylic acid, an important ingredient in the fight against acne. On clean skin, apply a thin layer on face. Because excessive drying of the skin may occur, start with one application, then gradually increase to two to three times daily if needed or as directed by a physician. If drying or peeling occurs, reduce application to once a day or every other day. Warnings: For external use only. Not to be used for children under 3 years of age. Avoid contact with eyes. If contact occurs, rinse thoroughly with water. Using other topical acne products at the same time or immediately following use of this product may increase dryness or irritation of the skin. If this occurs, only one product should be used unless directed by a physician. Discontinue use if excessive skin irritation develops or increases. If irritation persists, consult a physician. Keep out of reach of children. Salicylic acid acts like an exfoliant to promote the easy removal of dead skin cells. As such, it helps keep pores unclogged and reduces the build-up of P. acnes bacteria. This formula also contains soothing botanicals, including extracts of Canadian willowherb, sea heather, burdock root and avocado pears. When you suffer from acne, you want a solution – you want to clear up your skin to face each day feeling beautiful and confident. Mary Kay® Clear Proof® Acne System can be your solution. The Clear Proof® Acne System includes the following products: cleanser, toner, pore-purifying lotion and spot solution, each formulated with two percent salicylic acid, that work together to help clear up existing blemishes and prevent future breakouts. Plus, you can add two skin-loving Clear Proof® products to round out your regimen.